The Pyle PWRC81 speaker system delivers stereo sound to any room in your home or office without cluttering floor space. These 8” moisture-resistant speakers with marine grade construction can be placed indoors, outdoors or anywhere excessive moisture exposure is possible. The PWRC series speakers feature impressive power handling capability, heavy-duty voice coils and high-efficiency response rates – all to produce fuller and more rich sounds. Can be used for both in-ceiling and in-wall applications for a clean look. Convenient push-type speaker terminals allow for quick and hassle-free speaker wire connection. Kit includes mounting hardware and cut-out template for easy installation. 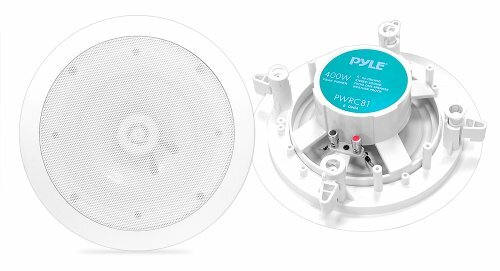 Achieve optimal sound performance and enhance your overall audio experience with the Pyle PWRC Speaker Systems. Sold as pair. If you have any questions about this product by Pyle, contact us by completing and submitting the form below. If you are looking for a specif part number, please include it with your message.